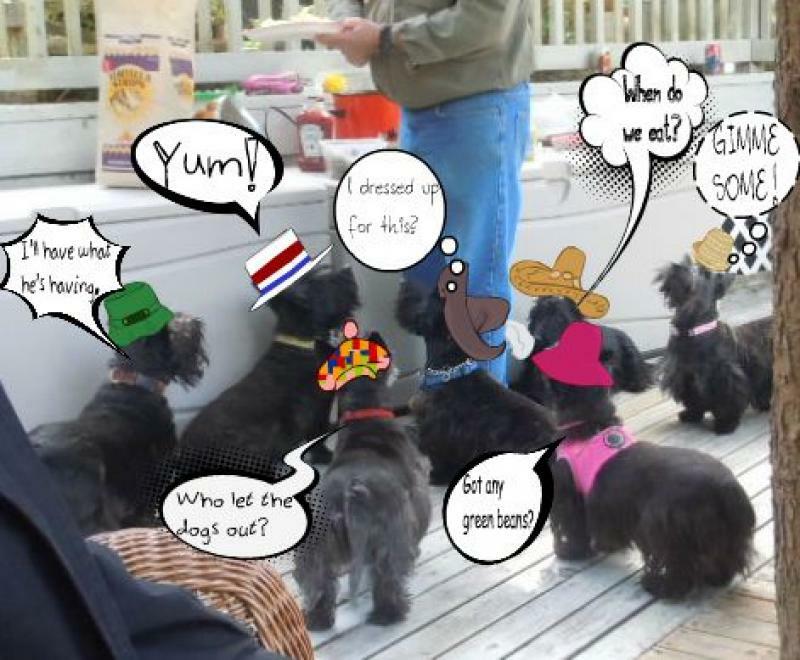 I think it’s about time for a Scottie picnic, don’t you? Yeah. Pass the beans. Of the green variety please. Fridays are fun around here. Somewhere along the line a furiend sent Us this foto and We had fun with it. Ah. The joys of photo editing, yes? Legalese: when you send me your photo, you agree 1.) that we can use it here on The Scottie Chronicles any time we want to and 2.) you give Us permission to have fun with it. This entry was posted in The Scottie Chronicles and tagged dogs, Foto Fun, funny dog pictures, pets, Scotties, The Scottie Chronicles. Bookmark the permalink. Make it big enough to share! Can never have too many of us at a party. Aye….we’re the life if it! Party time!! I bet no squirrel or rodent were safe there. Can you imagine the aarrooooos?! Looking like a blast, we be thinkin, that all of us need to get together and have one of those! You can have fun with our pictures any time you want. We love you and your blog! We’ve never had a convention. Gosh that’s a GREAT pawty photo!! !